EPCOT or the Experimental Prototype Community of Tomorrow to give it the full title opened in 1982 and I remember being blown away by this park the first time I visited. Let’s just say although I did enjoy our time here (helped greatly by the Food and Drink Festival which was in full swing), I was not blown away this time. Memory can be a funny thing….. Son however had an absolute blast in this park and some of his favourite rides and experiences were here. 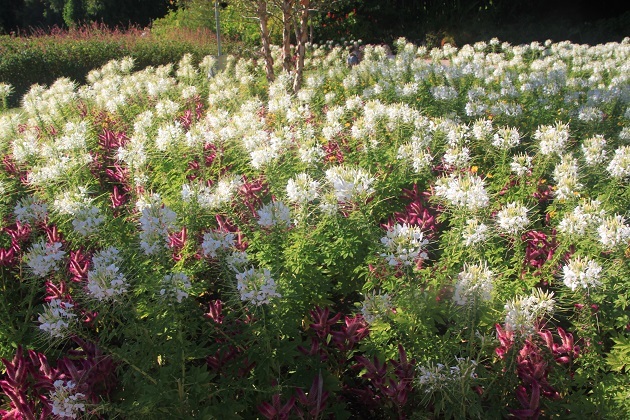 It is massive and at 260 acres is almost twice the size of the Magic Kingdom. We decided to pace ourselves accordingly and break our explorations into manageable chunks over several days. There is quite diverse entertainment and things to do here plus a glistening lagoon and some beautiful gardens so a lot to fit in. On our previous visit we spent most of the time dashing from one thing to another in a state of constant exhaustion and failed to take all this in. That was remedied on this trip. Our first day at EPCOT we arrived late afternoon after a morning of pool side relaxation, opting for a couple of hours wandering before dinner. 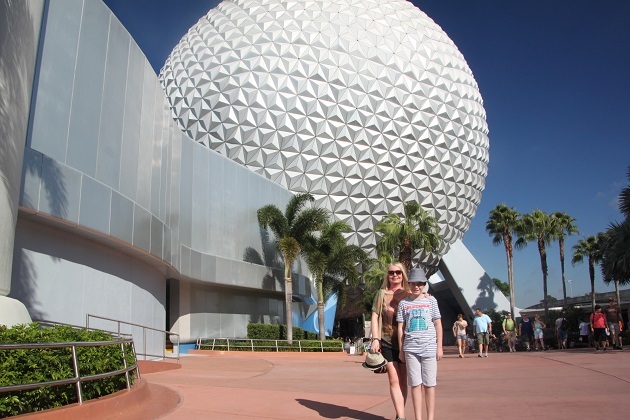 Our first port of call was Spaceship Earth, EPCOT’s icon – you can’t miss the giant golf ball wherever you go here. There never seemed to be a long line for this ride, we did it several times for that reason plus it takes 15 minutes and provides much needed respite from the hot Florida sun. We boarded our “time machine” vehicles and took a slow moving ride through the story of communications from cave paintings to the present day. I remembered this from last time but it seems to have been updated with new animatronic figures in some scenes. We saw Egyptians and papyrus, the printing press and my favourite part – the Renaissance. Dame Judi Dench narrates the whole thing right to the top of the 18 storey structure. At the top, after a view of “Planet Earth” you swing around and travel backwards to the bottom. Son enjoyed this and loved the personalised cartoons we watched en route. At the beginning of the ride they took photos and then used them in an interactive cartoon to show what the future could hold. Very clever and highly entertaining. We spent an eternity in the hands-on area after the ride. Son was in heaven, with many hours of computer game practice he proved to be a wiz at most things here. Husband and I were different varieties of useless and were thoroughly trounced. Amongst other things we played a driving game, delivered electricity to a town and played at being remote surgeons conducting an operation. A decision to join a long line to meet a host of Disney characters at the EPCOT character spot was not a great one. We figured we could set some good pictures with a host of different characters, we did but the wait was very long, very boring and definitely not worth it for us. 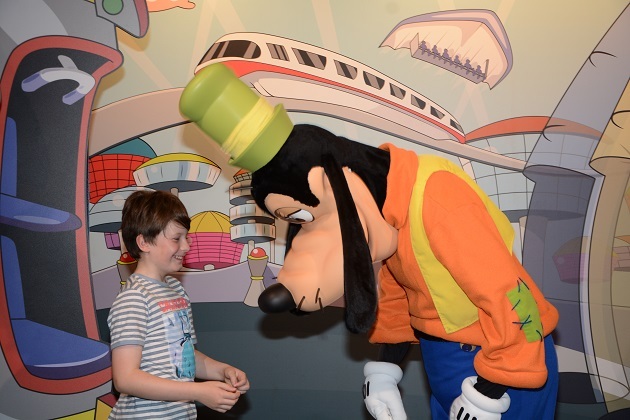 The whole place was brightly coloured – a bit like being in a cartoon – and eventually we shook hands with Mickey, had some zany pictures with Goofy and several others but Son figured we could have spent our time much better doing just about anything else. Deciding to call it a day after that, we briefly stopped in Club Cool for refreshments. Sponsored by Coca Cola it is a shop selling their merchandise but you can sample (for free) different Coca Cola beverages from around the world. 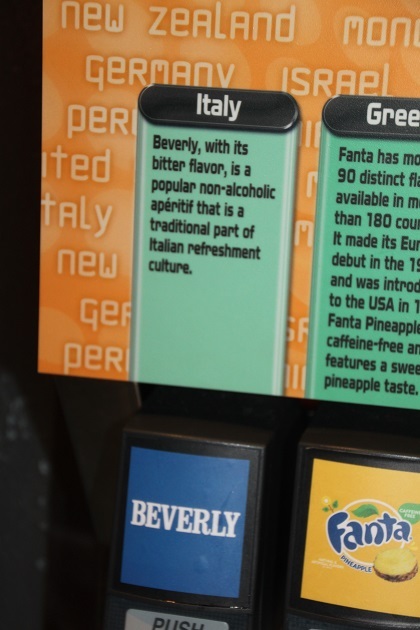 We started with Beverly – apparently an aperitif in Italy and thoroughly disgusting, so bitter and completely unexpected. We sipped Greek Fanta Pineapple, Thai Melon Frosty Fanta, Japanese Vegitabeta and my favourite South African Bibo Melone before the long trek back to our car. This brought back memories! I remember being quite overwhelmed by it all – but I think that was the science and future stuff as I was so young. Love the photo of the you both as space guys! It can be quite an overwhelming place I think, the sheer size of it all for one thing… Those photos were very entertaining – we starred in our own cartoon about the future in space which was so funny. 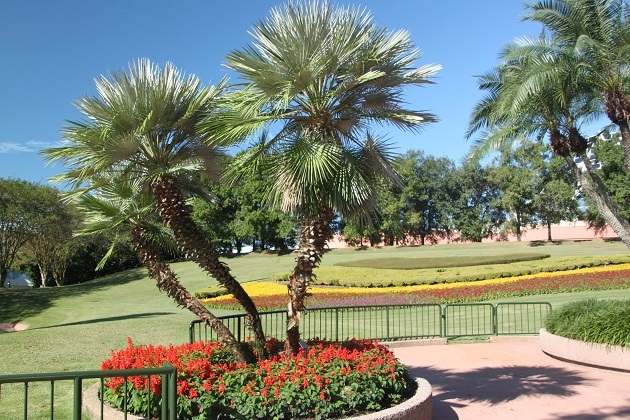 I remember Epcot being a huge disappointment but having said that I would gladly go back to World Showcase! World Showcase when the Food and Drink Festival is on is really great, lots of locals go during this to feast on great food from all around the world, we loved that!! I know what you mean though I had mixed feelings this time but they have updated and added some new stuff, our son couldn’t get enough of the new space ride and would gladly have come here every day. It is a totally different sort of theme park! 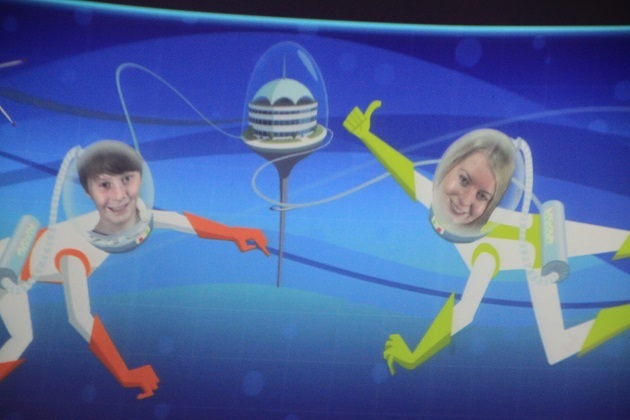 We loved those interactive personalised cartoons – think that’s why our son insisted we do this ride several times. Anything vaguely electronic and he’s up for that – no good for me at all!! Yes kids are great at anything electronic it seems – even my 3 year granddaughter can work a remote control and if I don’t stop her grabs my iPhone and iPad and tries to key in a password (not the actual password that is a closely guarded secret of course!). That’s the secret Rosemary – never give them your password, although our son has managed to hack some of our devices already!! Oh no you’ll have to become ever more inventive with passwords (the trouble is then I forget them)!! We also found Epcot disappointing. My husband had fond childhood memories of it that gave him some hopes but even he admitted it was shoddy. The whole place is shabby and tired. Spaceship Earth was our highlight too – though the kids also enjoyed the international village bits just to see stereotypes. Mostly I enjoyed how much quieter and spacious it was than the other theme parks. They would have to demolish it and start from scratch with something new for us to return though. The space and less busy aspect of it all really appealed to me too but I don’t think we’d really hurry back again. 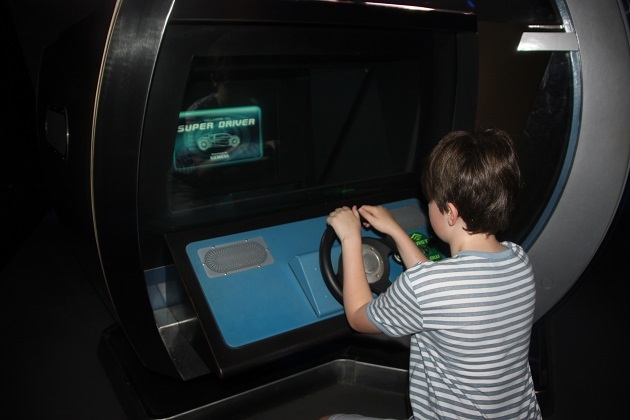 That said our son loved it here – the space ride, test track and the design your own rollercoaster thing were his favourite experiences of the whole holiday so you never know, we might come under serious pressure to go back! I love the international drink dispenser… It connects to my love of grocery stores when travelling. Who knew there were so many interesting flavours out there? I’m suspicious of the Beverly, though. I’ve been three times to Italy and never come across it, plus my Italian husband is oblivious. He says if we want bitter, we’ll drink Campari! I thought that about most of the flavours to be honest, wondered just how authentic they really were!! Campari, now that sounds more like it…. 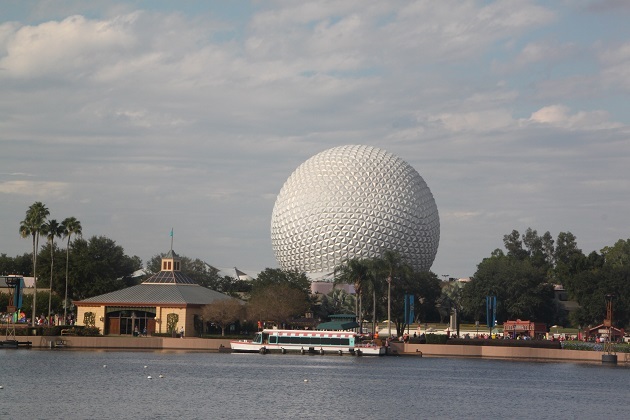 I visited Epcot in the early ’90s on the way to the Everglades and the Keys, and was seriously disappointed. I was mostly interested in the World Showcase, and it was just SO fake. The food wasn’t bad though, if pricey. I felt exactly the same way about the World Showcase this time, on previous visits when I was a lot younger (and less travelled) I did love it but this time the whole fake thing really hit me. However the Food and Drink Fair was really good and we also enjoyed sampling bits and pieces from around the globe. 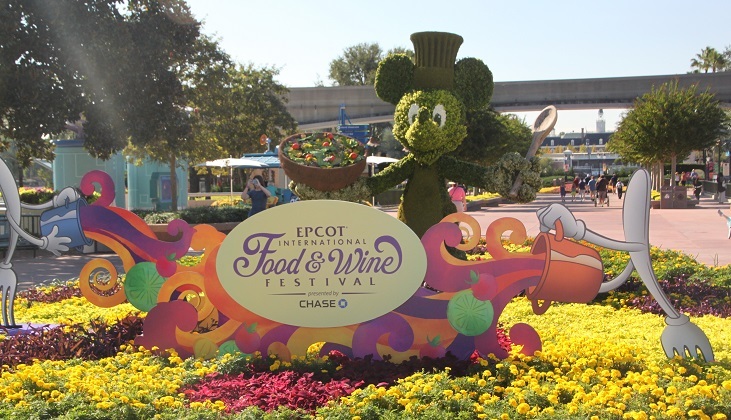 I know a lot of people are indifferent about Epcot but I’ve always enjoyed it, especially exploring the food…:) The food expo they have in October is very good. I was sad to see the little Norway ride leave which is being replaced by Frizen. That was always one of my favorite rides. It wasn’t much but it was fun. We managed to catch the Food and Drink fair George and absolutely loved that. It seemed to be very popular with the locals too who flocked here, I could totally see why. Agree with the Norway ride, I loved that too and was so disappointed this time to find it had gone! The food was amazing, you could literally eat your way around the world, everything was so tasty and different – we gave it a good go!! Love the space woman / space boy cartoon! 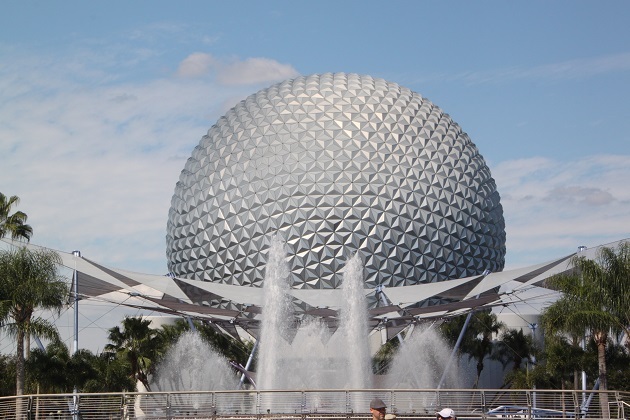 Sounds as though EPCOT overall must have been very innovative when it started but the future has overtaken it. It seems like people either love it or hate it…. the future has overtaken it definitely in some parts but they do have some good new stuff as well. 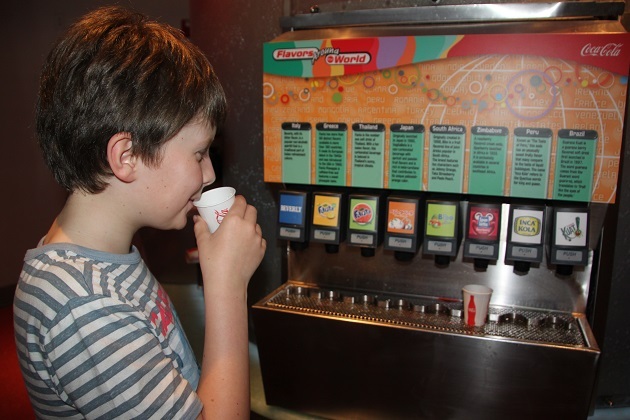 EPCOT sounds and looks interesting, for me the food aspect would be a tasty experience, your son clearly looks very content, take care. The food was the highlight for me for sure – tasting all different cuisines from around the world, my idea of a good time!! Sorry it wasn’t as great the second time around – but the food festival sounds fab! It was incredible, would definitely go back for that!! It’s very different to the Magic Kingdom, still some great rides and things to do and visiting all those “countries” is a lot of fun. Takes me back to when we first visited. Just before we started the voyage! Love all the parks, because I’m just a kid at heart! We are just starting the travel part of the Encore Voyage! I’ll be checking back often! I’m a kid at heart too – the parks are just the best place for people like that!! 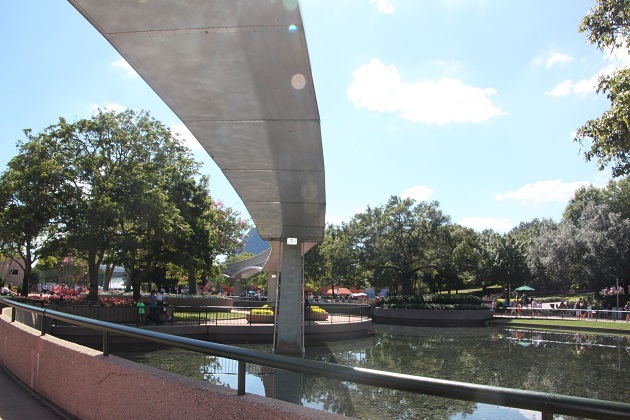 I went to Epcot yonks ago and must admit I don’t remember too much of the detail – but I did quite enjoy it. It’s interesting how a second visit to a place can feel like a totally different – and disappointing – experience. There’s a moral there somewhere! It wasn’t all bad though Susan, I did still enjoy it but you’re right, going back sometimes is probably not the thing to do!! Ha, this brings back memories. 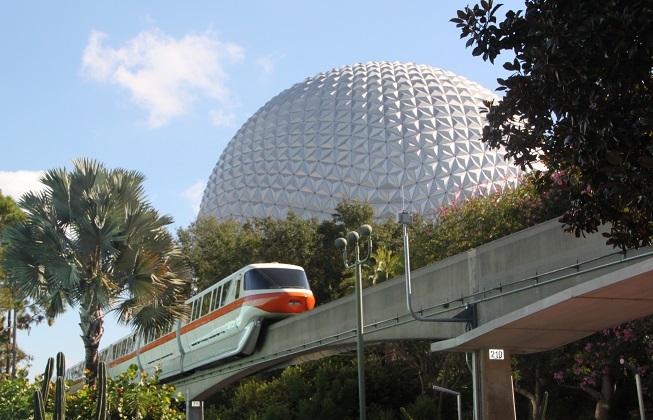 I was on a business trip many years ago and the whole group of 60 or more were taken to Epcot one evening. I got enthralled (lost) and didn’t get back to the bus on time, which left without me! Thankfully a kindly US police agent took pity on me when I asked him how I could return to my hotel, and gave me a lift back in his police car (thankfully not with the blue light flashing!). Definitely you won’t forget your trip to Epcot Denzil!! I’ve never head about that place ! Does it feel a bit outdated or you think you just remembered it differently ? My first visit was my first trip to Orlando, first time at Disney etc… I guess that just makes a huge impact and when you go back it’s not quite the same when you know what to expect. That said I did enjoy it, just not quite so wide eyed as then. It is a great place, completely different to a regular theme park with a whole series of different rides and experiences plus they have various countries of the world represented in different pavilions. A couple of the rides felt a little dated but they always have new stuff too so it’s always changing. I can totally see why! !